I realize that the US is a big country and it has a lot of land that it needs to defend, but that seems like an unbelievable figure, doesn’t it? More on war than all 50 states spend on health, education, welfare, and safety — combined! That’s just one of the many alarming statistics that I found in this post from Business Insider from 3 years ago. As it’s 3 years old, I don’t know if the the title of this post remains true, but I wouldn’t be surprised if it’s far off. I first went digging on this issue because one of the things I’ve been meaning to write about is how much the US spends on defense. As the above graphic shows, the US spends a lot on its military and not just a lot in terms of the amount of money it spends, bit it spends so much more than the country that spends the second most, China. In fact, the US spends more on its military than the next ten countries — combined! Do you think that the US spends too much on defense spending? If I were answering honestly, I’d have to say probably. According to a Gallup poll from February of this year, a plurality of American seem to agree. 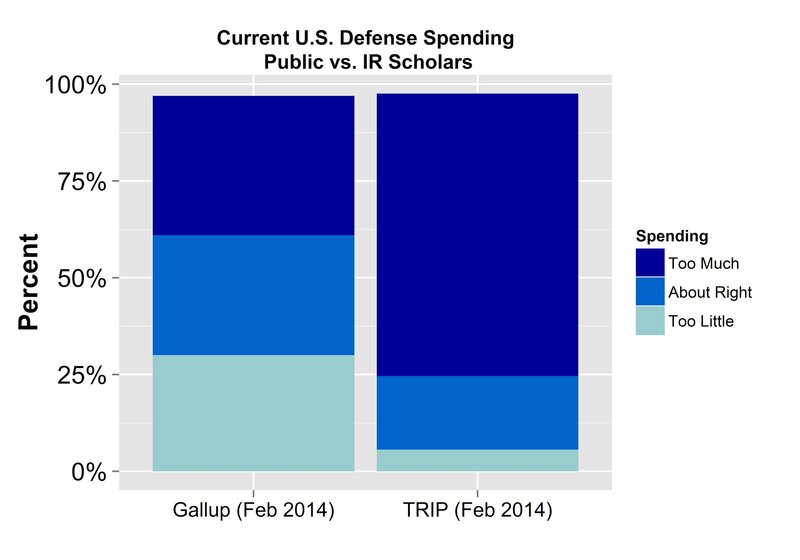 And it’s not just average Americans who think the US spends too much on defense, but scholars of international relations. That’s almost 75% of scholars of international relations who believe that the US spends too much on defense. The post where it comes from even parsed out some of the different types of international relations scholars. For instance, over half of “realists” believe that the US spends too much on defense and “realists” view international relations through the lens that the primary aim of a country (but they would call them states) is survival. Because the US military doesn’t just exist to defend the invasion of the physical United States. As the country with the biggest economy in the world, the US has a vested interest in maintaining a global environment that favorable to its interests. This means having the power to impose its will (for better or worse) on other countries that act against the US’s interests. To do this the US has to spend an incredible amount of money on research and development to make sure that it has the best military technology while also projecting force abroad to make sure its interests are maintained. Nonetheless, in a parallel universe, it would be interesting to see how the citizens of the US would survive/thrive in a world where defense budget for the the US is cut in half and that money is redirected to other important areas like health and education.